Nike Lunar Eclipse 5 Review - To Buy or Not in Apr 2019? The Nike Lunar Eclipse 5 is the fifth installment of the Nike Lunar Eclipse line. From first glance, the appearance of the shoe is simultaneously familiar and foreign to its predecessors. A semi-external sideways veering Flywire lace locking system is one of the more prominent features of the shoe. The sheer mesh window has once again skipped a generation with the next noticeable feature, the mesh upper which forms an almost unibody appearance. The Nike Lunar Eclipse 5 is the fifth attempt by Nike to tweak a shoe to perfection. Overall, the entire line has seen many additional features as well as the subtraction and reintroduction of others but remains to be a shoe that improves with each new interpretation. The shoe continues to be lightweight, supportive, stable and comfortable. A Nike Lunarlon midsole reduces stress and painful pressure points on feet. Unlike previous models, the overall fit is less restricting without being too roomy for your foot to slide around in. The Dynamic Support System provides superior heel cushioning and stability while remaining flexible. Like previous versions, durability is an issue. Traction has slightly decreased due to the texturized pattern change on the outsole. The outsole on the Nike Lunar Eclipse 5 is identical to the Lunar Eclipse 4's outsole. Strategically placed segments of Nike's Blue Ribbon Sports 1000 rubber can be found on the outsole's back heel region. Moving towards the front of the outsole, you will find ovular rings which are broken down into three tiered sections, providing the user with a decent amount of traction and a fair share of flexibility. The outsole does a great job with durability in the long run but did not provide good traction on wet surfaces. The midsole is composed of a dense layer of foam surrounding the Nike Lunarlon foam in order to provide the right amount of comfort to stability ratio. Nike calls this their Dynamic Support System. This wedge-like layering structure inside the midsole will help runners who overpronate. The upper now features a side leaning lace locking system, proving to be both functional and stylish. The lace locking system is made from the enhanced Flywire that has been the primary go-to lacing system since the Lunar Eclipse 3. You will notice the lacing system is partially exposed towards the top region of the upper. The lacing system alone gives the upper an improved custom fit, releasing possible tension that some runners may have experienced on the top portion of their foot. The material of the upper is a lightweight, breathable mesh that creates a sleek look and custom fit. The mesh material used on the Lunar Eclipse 5 is properly perforated for good breathability. The Lunar Eclipse 5 follows in the footsteps of past models, maintaining its signature light weight. The men's version of the shoe is 10.6 ounces, while the woman's version is 8.6 ounces. The perforated mesh upper of the Nike Lunar Eclipse 5 makes this shoe extremely breathable. The material is lightweight and allows air to pass easily throughout the entire upper. In terms of breathability, the high-quality mesh is similar to Nike's Flyknit material. Both the upper and midsole work together to make this shoe very comfortable. The Dynamic Support System not only protects your foot, especially if you have a tendency to overpronate, but also provides exceptional comfort. The Lunarlon foam will keep your foot supported and cushioned for the entire ride. The Nike Lunar Eclipse 5 is a stylish running shoe. Most variations of this shoe come in a tri-color scheme with the mesh material being one color, the upper midsole and heel clip a secondary color, and the bottom half of the midsole dons a complimentary third color option. There is a wide selection of color options available. The silhouette gives the shoe an overall minimalist look, fashionably speaking volumes and making statements through textures and accompanying materials. The Flywire lacing system is not only functional but very stylish. The outsole of the shoe features a carbonized Blue Ribbon Sports 1000 rubber material that will last the lifetime of the shoe on multiple terrain options. The outsole proved to be an amazingly durable aspect of the shoe, providing a consistent amount of grip throughout the life of the shoe from start to finish. However, the Nike Lunarlon midsole, though an amazing feature when the shoe is brand new, will eventually wear to the point it loses the initial edge it had over the competition. The foam in this shoe goes from being springy and responsive to flat after miles and miles of absorbing impact, almost similar to how a memory foam eventually wears down in the area that gets used excessively. This shoe offers its best protection in the midsection to the heel of the shoe. The heel clip on the shoe is made from a harder plastic material that will prevent and protect your foot from rolling too far inward. The entire system mimics the effect of a roll bar, stiffer and more stable in the upper region of the shoe. Right out of the box, the responsiveness is amazing. The Lunarlon midsole provides a drop that allows your foot to get a better feeling of the road beneath you. The Nike Lunarlon foam is a highly advanced foam, but in the same breath, it's far from perfect. The ovular grip below on the outsole that drops from the midsole behave like receptors for your foot, giving you a great sense of your surrounding terrain that you're standing on. The actual midsole itself is responsive with transferring the energy back to your foot as you run, imitating a spring-like effect. The primary source of support is the Dynamic Support System. The Dynamic Support System does an abundance of wonders to protect your foot. The wedge that's inside of the Lunarlon foam found in the midsole was constructed specifically to correct overpronation and give your foot the necessary support when you run, walk, or rest. These shoes perform best on the road. Any dry concrete or pavement proved to be a great surface to experience the overall grip the outsole was capable of. The price for every new iteration of the Lunar Eclipse series has been pretty consistent avoiding typical price increases that sometimes come along with annual upgrades in technology to a shoe. The shoe retails for around $135. This particular outsole mold is seeing its second year with the Lunar Eclipse. The outsole initially debuted on the Lunar Eclipse 4 and was carried over to the Lunar Eclipse 5. The traction for this shoe does amazing on dry surfaces and is very responsive on the road and pavement. The user may experience a "slip of grip" when dealing with wet surfaces mainly due to the structure of the outsole grips. The forefront area grips meant for traction on the outsole are constructed in a ringed pattern to enhance flexibility and freedom of natural movement, which it did, but the drawback was the structure's grip performance didn't do as well when surfaces were wet. Flexibility is where this shoe really shines. Flexibility can be found in almost every area of the shoe. Beginning with the upper, the mesh allows your foot to move naturally by providing a custom fit. The outsole has been crafted to a specific pattern that now allows your foot to be in control of how you adhere to surfaces, rather than your foot complying to the present boundaries of movement allowed by the outsole. Overpronating runners need stability when they run and this shoe does exactly that. The best part about the stability of the Nike Lunar Eclipse 5 is the overall subtlety of the stability. When your heel hits the pavement, instantly the segmented crash pads on the outsole go to work absorbing the impact of how your foot landed. Next, the inward roll is guided by a rear heel clip that keeps your foot stable and inline during overpronating motion, all while the wedge in the Lunarlon midsole is correcting your roll without you even having to think twice about any of the technology working for you. The drop for the Lunar Eclipse 5 sits at 11 millimeters, which is not too high as previous models of this shoe which had an irritatingly incessant high downhill incline effect while running. 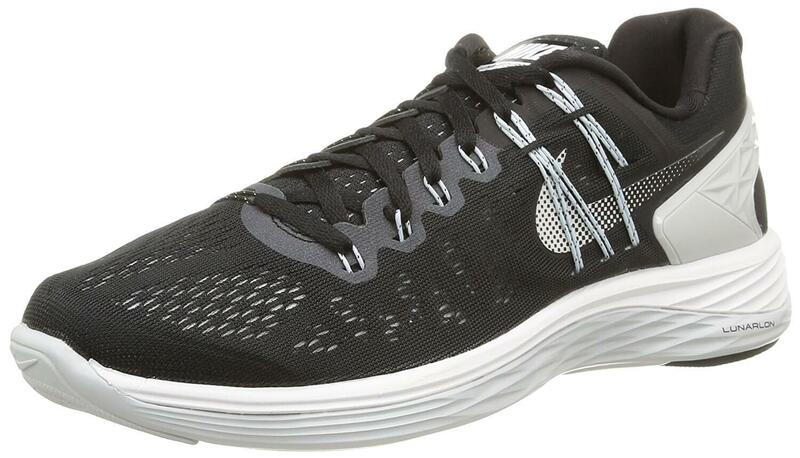 The Nike Lunar Eclipse 5 is a shoe that is marketed towards the casual runner who enjoys a cushioned ride. Nike took areas that the Lunar Eclipse was already proficient in and enhanced them. From when the original Lunar Eclipse initially debuted, the main purpose was to create a stable reliable running shoe. Nike had 4 Lunar Eclipses to look back on and study what worked and what didn't, and with the Nike Lunar Eclipse 5 have they finally gotten things right? Yes, Nike has created an amazing shoe for runners who need their foot supported and stable when they're in motion. Keep in mind that this shoe is aimed at the beginner to an intermediate level runner and may not be suited for a more experienced runner.